Mikael Långbacka joined the UMO team in 1984 and has kept his place in the orchestra ever since. He was away for four years when playing in the Swedish Norrbotten Big Band and had already gained big band experience, as a student, with big bands in Tapiola and Pori. Långbacka has also played in various classical music orchestras, including at Finnish National Opera. 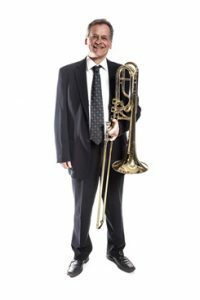 The confident musician is renowned for playing not only in large orchestras but also in small bands such as his own trio and the 1990’s trombone quintet, In The Spirit Of Jay&Kai. Långbacka was also involved with Zone, a band that aims to showcase and advance the work of Finnish composers from different music genres. He has been active in Nordic projects, including the line-up of A Tribute Lars Gullin in 1997–1998 and The Nordic Trombone Quartet in 1999. Långbacka has also contributed to numerous other artists’ studio sessions. He has backed, for example, Anssi Tikanmäki and Kerkko Koskinen, and has played in less well-known, yet no less interesting line-ups such as Big Bad Family (Finalmix 1994).